A futuristic racing game which utilises the player card system, this machine will also enable the data to be exchanged with the Game Cube console version of the game. The game features, race mode and time attack mode. Players can choose a number of pilots each with they own unique craft. Each craft is rated in 3 main areas Body, Boost, Grip, allowing players to choose the perfect fit for their driving style. 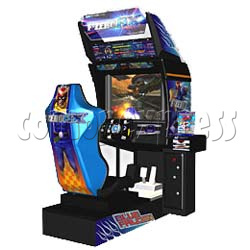 The player card system on F-Zero is called the F-Zero license card and works the same way most player card systems do, the card is unique to player and contains the player's preferences, hi scores, etc.